It’s one thing to watch the Discovery Channel or Animal Planet on television and see wildlife in its own habitat from a distance. Zoom lenses can only bring the animals so close. Film-maker John Downer has come up with a new way to get cameras in the midst of these animals as they go about their every day existence. He’s camouflaged the cameras and attached them to the trunks and tusks of elephants. The big beasts maneuver slowly through the landscape and are as welcome as any animal. 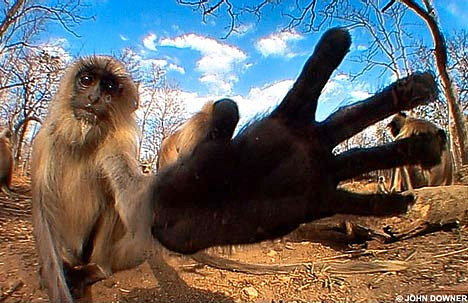 Since the elephants aren’t considered a threat, Downer’s cameras get up close and personal with all varieties of animals. The pictures are incredibly sharp and amazing. The scenes they capture, whether it’s playful leopards or a langur monkey fascinated by its own reflection in the camera’s lens, are fascinating. PopFi brought you a look at African tribal fashions inspired by Mother Nature. Now it’s Mother Nature herself who takes the spotlight in Downer’s stunning photos.